I’ve been enjoying the Wassail Mulling Spice Mix from Rodelle this winter. The spice mix is inspired by the blend of spices – which includes cinnamon, vanilla, nutmeg and orange – that is typically used to make mulled wine and cider. You can easily make your own blend with whole spices from your pantry, but you can’t make a mix that will stir into a drink of any size as easily as this one, which makes it perfect for making Mulled Tea Lattes this winter. This drink is exceptionally easy to make, though you will need a container of Wassail. Simply brew up your favorite classic black tea, add the spice mix and a bit of sugar, than top the tea off with steamed milk. 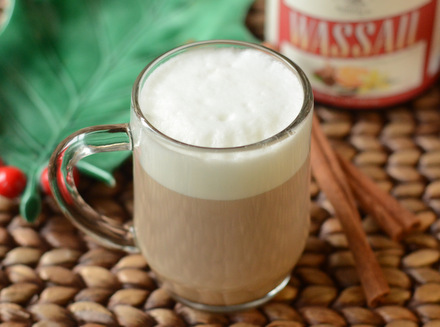 The drink has just the right level of spice to capture the flavor of the season without turning it into a more heavily spiced chai tea drink. It’s warming and perfect for sipping on a cold evening instead of hot chocolate. One of the nice things about the spice mix is that it is just as easy to mix up a single cup as it is to mix up a pitcher. I prefer to drink this one cup at a time, however if you are doing any entertaining and have friends that also enjoy tea, you could easily scale up this recipe to serve a crowd. Brew black tea and pour it into the mug of your choice. Add in spices, sugar or syrup and stir to incorporate. Top with steamed milk and serve.